Lt. Gov. Evelyn Sanguinetti speaks to attendees of the Opioid Crisis Conference. Illinois Lt. Gov. Evelyn Sanguinetti discussed the state of Illinois’ response to the opioid crisis in a speech at the I-Hotel and Conference Center on Friday. The speech was part of the University’s social work policy and practice responses to the opioid crisis conference. The Governor’s Office implemented a statewide helpline that opioid users and others affected by the opioid epidemic can call to receive treatment and recovery support services, she said. According to a recent report by the Illinois Department of Human Services, of the 2,278 Illinois statewide drug overdose deaths during 2016, over 80 percent were opioid-related fatalities. 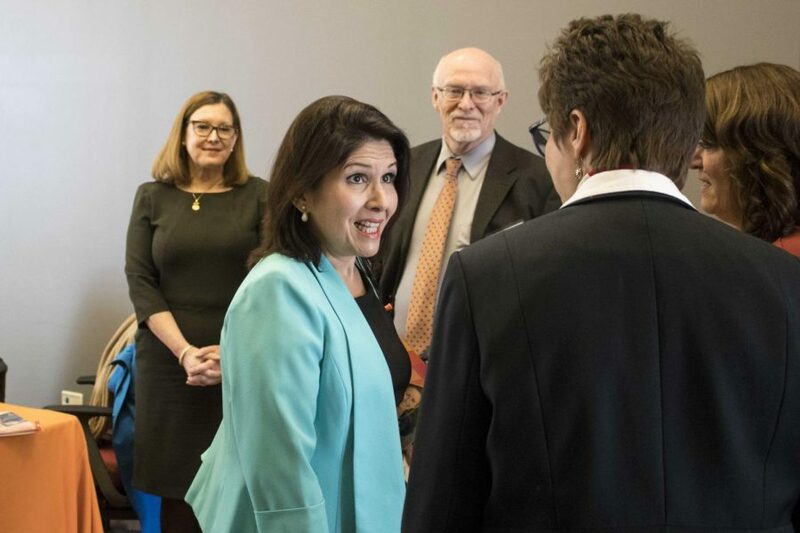 Sanguinetti said Governor Bruce Rauner signed a law requiring doctors and other prescribers of opioids to check and record their actions in the Prescription Monitoring System, a database that tracks prescriptions of opioids. Sanguinetti emphasized the importance of community-based methods of solving the opioid epidemic and dispelling the stigma around opioid treatment.